On this incredible trip, you will embark on a Culinary and Wildlife experience second to none with two award-winning chefs, Alison and Sidney. Discover the breath-taking beauty of Cape Town, visit some of the finest wine estates in Stellenbosch, Franschoek and enjoy traditional Cape Malay Cuisine. Experience hands on cooking classes in our new kitchen on the award winning ‘Zevenwacht Wine Estate’ near Cape Town. Home to soaring Table Mountain, golden beaches and bountiful vineyards, Cape Town is sure to capture your heart. We fly into the wonder of Namibia where we stay at prime wildlife locations at some of the world’s finest game reserves where we will enjoy game drives and have the opportunity to see many of Africa’s incredible animals including, The Big Five. You will track cheetah on foot, cook under the African stars with local chefs and meet local tribes. You will be staying in luxurious lodge accommodation. If you are eager for an even deeper and exhilarating experience, come on our extended trip and enjoy the additional Fly-In Safari that focuses on the Namib Desert, one of the oldest deserts in the world. This scenic flight in Namibia guarantees to be one of the highlights of your trip ! No part of the desert is more stunning than Sossusvlei, with its monumentally high dunes, their sinuous crests and warm colours changing as the day waxes and wanes. You will be mesmerised by the incredible views. COMING SOON! A Culinary Tour of France with le Calabash. Le Calabash takes you on an exclusive Culinary Adventure through France’s finest food, wine and cultural regions. Come and enjoy a second to none gourmet experience, learning skills and techniques through hands on cooking classes with award winning chefs and visits to the markets. Indulge in classic French cuisine and dine at Michelin-star restaurants. Discover wine estates, taste some of France’s most celebrated wines and sample regional specialities. Experience many of France’s most well-known attractions including le Mont Saint Michel, the Eiffel Tower, les Châteaux de la Loire, the Medieval town of Carcassonne and top cities such as Bordeaux, Nice, Paris, Bayeux, Lyon… To include dining at le Train Bleu, Paul Bocuse, Gordon Ramsay, the Old Stable. A journey through France that will leave you with many special memories. The queen of spices took time to introduce itself to the French culinary scene. Then it was able, thanks to its lemony flavour and camphor, to attract chefs, pastry chefs and chocolatiers who have learned to manipulate its presence to tame its potential to overpower. Both genera are native to India, the largest producer until the late 20th century. The German coffee planter Oscar Majus Kloeffer introduced Indian cardamom to cultivation in Guatemala before World War I and by 2000 that country had become the biggest producer and exporter of cardamom in the world, followed by India. Some other countries, such as Sri Lanka, have also begun to cultivate it. Elettaria pods are light green, while Amomum pods are larger and dark brown. It is the world’s third-most expensive spice, surpassed in price per weight only by vanilla and saffron. Known for thousands of years as a perfume and a medicinal plant, it was quickly used in cooking, particularly in pain d’épices from the twelfth century. It is the star of Indian and Asian cuisines, but it is also very popular in Africa and in Northern Europe, where it was discovered by the Vikings. Finns, Norwegians and Swedes who use it in cured meats, pastries and hot drinks. In France, it was used for a long time in teas and infusions, but chefs and pastry chefs, thanks to their travels, integrate it more and more into savoury and sweet dishes. The taste varies depending on the type of cardamom. The green one is considered as the most perfumed, is both peppery and lemony, and one to two capsules are sufficient to flavour a dish for four to six people. The black cardamom, named “grand cardamom” leans towards camphor and has a very strong flavour. The white cardamom, obtained by the bleaching of the green, reveals a flavour of pine sap. However, all of them bring an abundance of freshness into a dish. Both Alison and Sidney use cardamom when they have the inspiration to introduce an Eastern flair into the dish they are creating. Alison believes that chocolate and cardamom is a marriage made in heaven and her Madagascan chocolate and Cardamom Macaron is an all-time favourite with ‘le Calabash’s’ French clientele. Sidney, who grew up in Kwa-Zulu Natal says that he has known the cardamom from a young age and that each and every time he works with it, that it takes him back to his childhood and the flavours of a Durban Indian Curry. In powder, cardamom loses its perfume quickly and given its expensive price, it is a shame to use it this way. The seeds in the capsules must be used carefully to gain more taste. Roast them slightly in a pan or crush them before cooking them. For a long time, cardamom was used in shortbreads, madeleines, muffins, brioches, cakes and crumbles and also go well with pears, apples and citrus. In the school, cardamom perfumes many pastries like panna cotta, macarons, flans, eclairs and is especially effective in flavouring lemon and chocolate cakes. Red fruits, cardamom and chocolate are a perfect marriage. Take a ‘Walk on the Wild Side’ and explore working with this exotic spice in your kitchen more often. A Cape Malay dish that originated from Malaysia, called Sesates, this is an all time favourite on the South African Barbecue, served with rotis and South African fruit chutney. Cut lamb into bite-size cubes and place in a large mixing bowl. Peel onions and cut into eighths and separate fillets. Peel garlic and slice thinly. Gently stir cloves, bay leaves, ginger, garam masala, turmeric, onions and garlic with the lamb. In a bowl, whisk vinegar, sugar, salt and apricot jam together. Pour over lamb and mix. Cover with cling film and marinate in a refrigerator for about 16 hours. Strain meat and skewer the lamb, onion, apricot and bay leaf evenly on to skewers*. When grilling on the Barbecue or a grill pan, lightly brush with a little oil. This was our first le Calabash ‘An African Culinary Adventure’ group and since then we have taken nine groups on this adventure to Cape Town? South Africa and Namibia, where we Cook with Local Chefs, over the coals and under the African Stars. We visit the world’s most natural Game Reserve, Etosha, track Cheetah on foot and enjoy the local culture and culinary offering. All four adventures to Africa are fully booked and we are about to publish our 2017 dates. Sossusvlei has monumentally high dunes; their sinuous crests and warm colours changing as the day waxes and wanes. These gigantic star-shaped mountains of sand are formed by strong multi-directional winds; they are at their highest and most spectacular where the west-flowing Tsauchab River empties itself into the Vlei. The warm tints of the sand, ranging from apricot to orange, red and maroon, contrast vividly with the dazzling white surfaces of the large deflationary clay pans at their bases. When it has rained sufficiently in the interior for the Tsauchab River to come down and fill the main pan, flamingos and other aquatic birds are drawn to the area. At the park entrance to Sossusvlei is Sesriem Canyon, where centuries of erosion have incised a narrow gorge about 1 km in length. At the foot of the gorge, which plunges down 30 to 40 m, are pools that become replenished after good rains. Sesriem derives its name from the time when early pioneers tied six lengths of rawhide thongs together to draw water from the pools. As we have Thanksgiving on our doorstep, we thought it would be nice for us to share a classic South African favorite with our American friends. South Africans love Pumpkin and Butternut Squash. Here is a le Calabash favorite and Happy Thanksgiving to all our American Culinary Adventurers. This is a classic Cape Malay dish with sweetness and spice. Really nice with Lamb, Venison and East Asian Fish Dishes. It is important to ensure the pumpkin is well drained of all its excess liquid, dry out in a sauce pan by cooking over a low heat without a lid. 1. Place all ingredients, except eggs in a mixing bowl with paddle and place on slow speed. 2. Add eggs one by one and mix till you have a thick batter. The batter should hold its shape when spooned. 3. Heat a little oil in a frying pan over a medium heat. 4. Scoop a heaped tbsp of batter and drop into pan, but ensure they do not touch. 5. Fry until firm and golden brown, flip over and fry. 7. Serve hot with plenty of dusted cinnamon sugar. When the bowl finally made its way to me, there was no hesitation. No taunt was necessary. I quickly popped one of the worms into my mouth and bit down. It was crunchy, chewy, and spicy all at once. 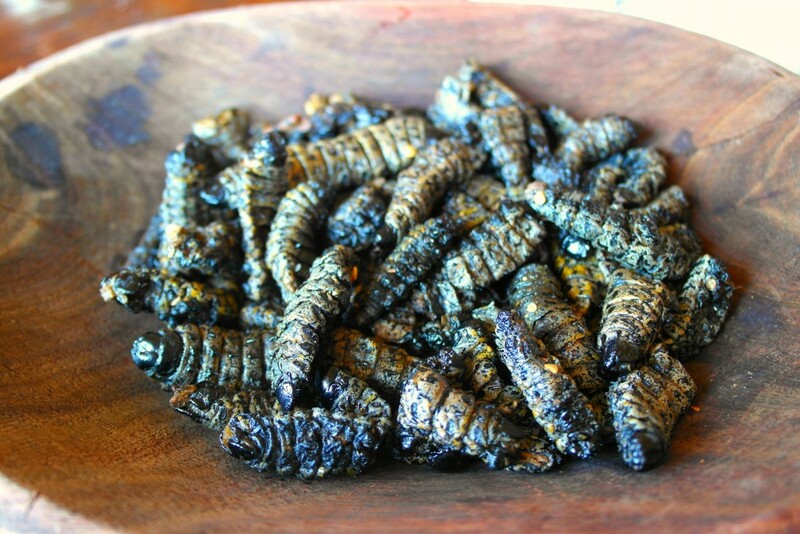 While this was by far the most outlandish thing that we ate on our African Culinary Adventure with Le Calabash, it highlighted why we had chosen more of a food focused vacation for our African odyssey. We desired a tour that offered not only safari related activities but also a cultural experience. The natural abundance of the fair cape and the various cultures that influence her have cultivated a cuisine that is both diverse and world class. Chefs Sidney and Alison Bond who lead the tour make sure that you try it all from the welcome dinner of a traditional South African Braai to classic French and Dutch cuisines found in Franschhoek. 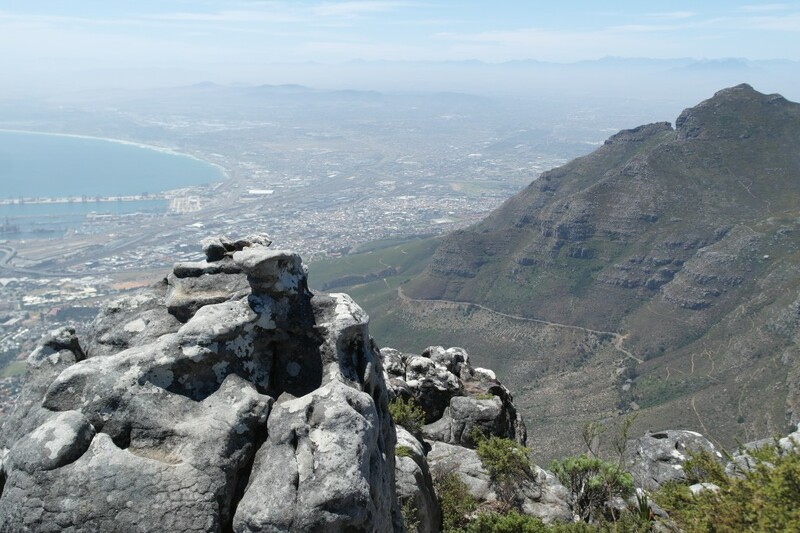 The tour also includes stops at some of Cape Town’s top attractions like Table Mountain and the V&A Waterfront. 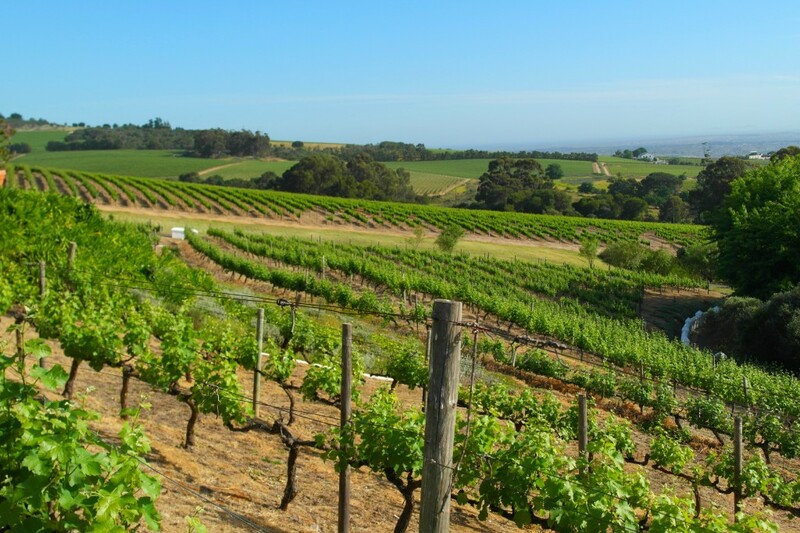 There are also plenty of winery visits along the way to sample the best of the growing viticulture region. Words can’t describe the experience of a safari, which is why once you go on one you know it won’t be your last. From the first giraffe you spot on the ride to Etosha National Park to the pride of lions stalking their prey, you develop a deep-rooted addiction to see and experience more. 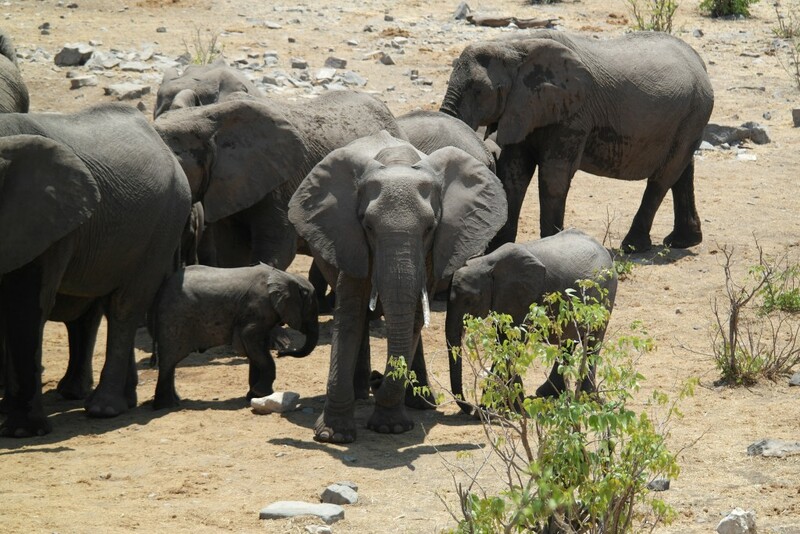 A favorite experience was watching a pack of over fifty elephants descend upon a watering hole. We watched for over an hour as both children and adults alike splashed in their afternoon refreshment. An African Culinary Adventure also visits the Africat Foundation. 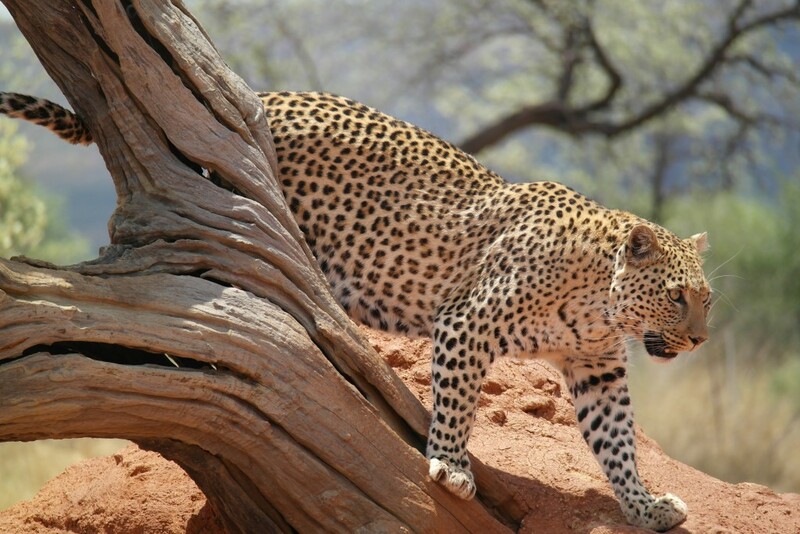 Africat’s mission is to “strive towards the long term survival of Namibia’s predators in their natural habitat.” Here, you’ll get so see some of the harder to spot big cats like cheetahs and leopards as they are rehabilitated for release back into the wild. All the excitement works up an appetite that finishes in a lesson on how to cook wild game. It’s the perfect conclusion to an African Culinary Adventure and the journey of a lifetime. Bryan Richards is a food, travel, and craft beer writer. He has a passion for exploring regional food and drink and enjoys encouraging readers to discover new places and tastes in a way that inspires curiosity and motivation. For more info, please visit The Wandering Gourmand.